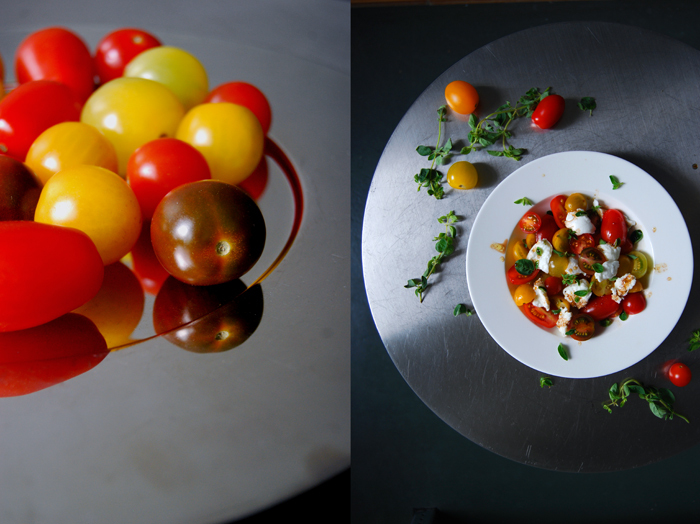 Just one more time, before I let go of one of my most beloved summer salads! 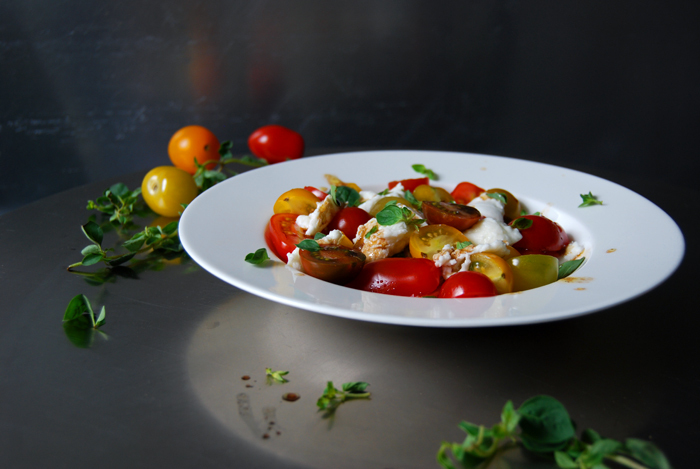 I need one more Caprese salad, the last one, before I say goodbye to this easy yet so delicious combination of fresh tomatoes and Mozzarella di Bufala. 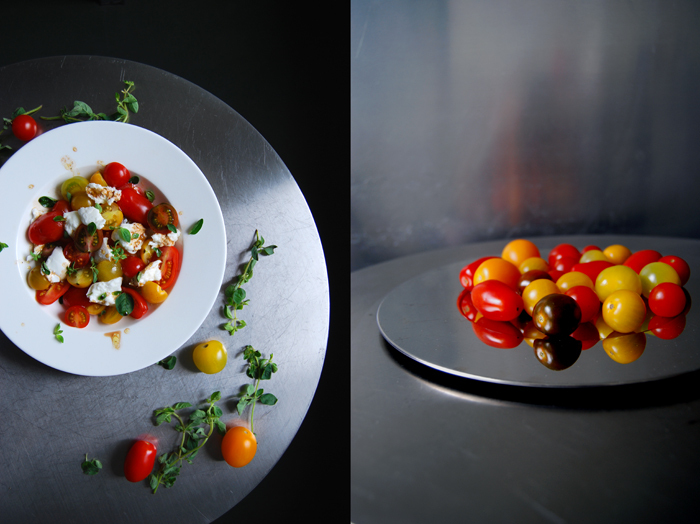 As much as I look forward to and enjoy the new season with its culinary qualities, I do miss my summery dishes sometimes, especially when I look at our holiday pictures of Malta. The memories of my Mediterranean outdoor cooking pop into my head and pull me into a different mood of food. A mood that demands for Mediterranean flavours, colours and smells, no pumpkins, cabbages and pies. 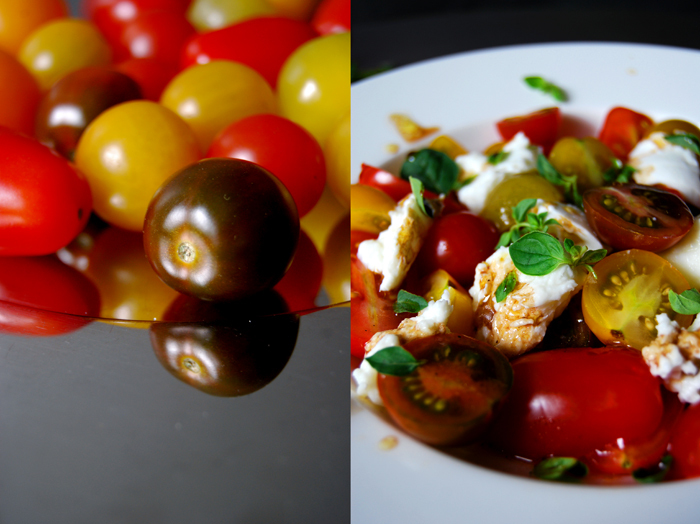 So as long as I don’t have to to compromise in taste, ripeness and sweetness, I enjoy my colourful small heirloom tomatoes and their late summer coloured prettiness on my plate. I don’t have to worry about any season when it comes to Mozzarella di Bufala, the organic produce that I use is so creamy that it almost reminds of Burrata. I just have to tear it into pieces and it coats the red and yellow fruits in its silky milkyness. 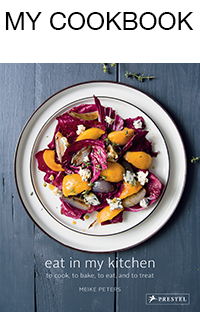 The whole composition is perfect, with a quick orange vinaigrette, smooth and fresh, but it needed something different to pay a little tribute to the month we’re in now. No August, no sweet basil, this is over now. This is the beginning of a colder, stormy season, falling leaves and earthy smells. 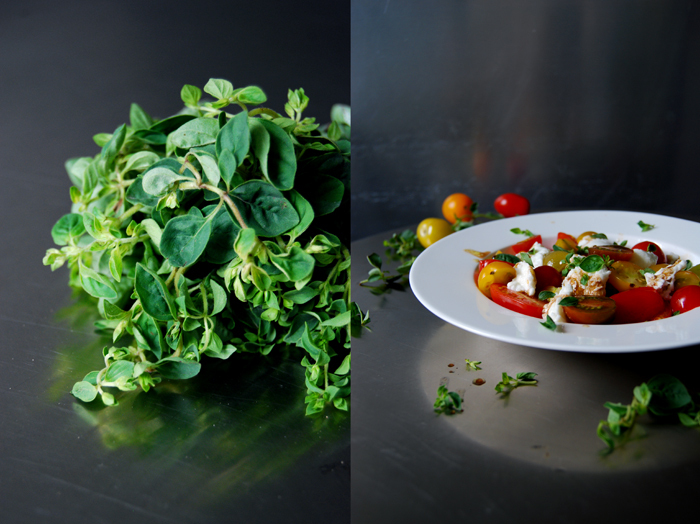 I didn’t want to add more sweetness, I wanted something stronger almost harsh, so I brought in some fresh oregano. The little leaves taste flowery yet a bit bitter, this is late summer in the south to me! Whisk the ingredients for the dressing and season to taste. 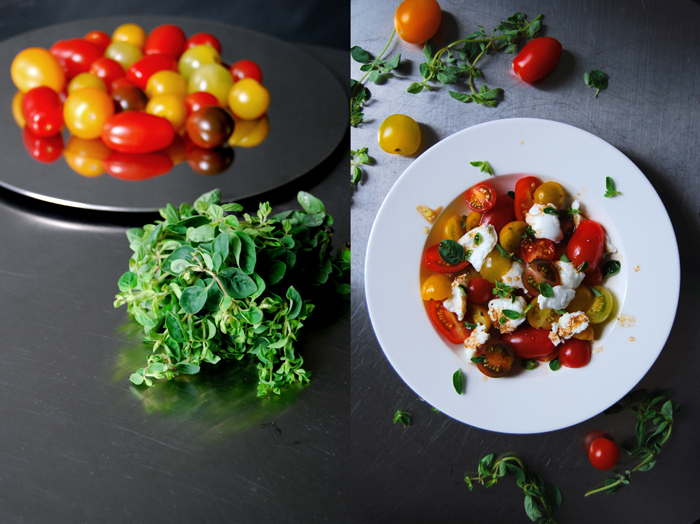 Arrange the tomatoes and mozzarella on a big plate and sprinkle with the vinaigrette and oregano, serve immediately.